MONTESSORI GUIDE is a resource tool for practitioners to demonstrate what quality Montessori looks like and needs to take into consideration in order to be implemented. Montessori theory is straightforward. It is deeply rooted in neuroscience and the natural unfolding of human development. Montessori practice, on the other hand, can be complex. Capturing authentic Montessori practice on film for professional development purposes means showing the work of children in their prepared environments. We decided to seek the child who emerges under the conditions described by Dr. Montessori in her writings. 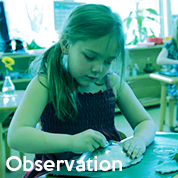 Our creative team traveled coast-to-coast across the United States, capturing ordinary days in Montessori environments on video to show a diversity of real classrooms with real situations. Filming took place in a variety of communities: urban, rural and suburban programs; public and private sector settings; at corporate child care centers and in home based care. Topics of concern in daily practice are emphasized. Join us as we begin delving deeper into our craft! The acceleration of technology and the complexity of changes that are driving our current society will define the future for today’s children. MontessoriGuide.org is sponsored by AMI/USA.